This disc is marked 'Contemporary Classical' but the music it presents is far from what you might conventionally expect from that label. It is only contemporary in a similar sense to the 'modernity' of Swiss composer Richard Flury or of the 1970s music of George Rochberg. In fact it's pretty much in the classical-romantic 'frame'. Jeverud studied at the Swedish Royal College of Music (1982-1989) and has written a considerable amount of music in most media. He speaks, in his credo printed in the booklet, of atonality as a signal adopted by some composers to show that they are serious and have ambitions. Jeverud takes the view that the line between art and entertainment should be easily spanned. As he points out, the artistic world is now much more accommodating of a wide spectrum of styles. Certainly the Swedish National Council for Cultural Affairs show that in the most eloquent way by financially supporting this disc. With the exception of the more classically-orientated String Trio and the piano solo that gives the disc its name, Jeverud's adopts a language that would have been instantly accessible to composers of the Franckian Belgian or French 19th century schools. There is a strangely elusive and very brief 'foreword' to the first movement of the Quintet where the solo violin sings a tentatively climbing Bergian theme. Otherwise think in terms of the Chausson Concert. 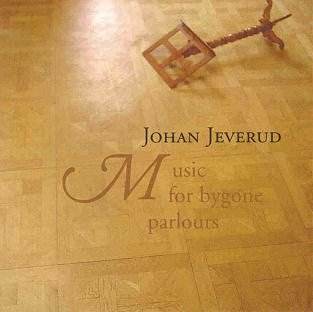 Jeverud�s music is tumultuously impassioned, gracious and kindly. The latter quality can be heard in the second movement of the Piano Trio. It's there also in the very touching echoing theme of the Quintet the first movement of which has a grand Brahmsian swell and surge. The Quintet's finale is dancingly joyous in much the same way as Brahms' Fourth Symphony. This fugally playful splendour will confuse musical archaeologists in ages to come. The nine choral songs are predominantly set in the language of Peterson-Berger and of the Brahms' volkslieder with a dominance of honeyed unison singing. This is offset by the occasional alternation of textures arising from the separation of men and women in a spatially differentiated dialogue. It is all very sweetly romantic, rounded, lyrical, innocent and uncomplicated. It was a sensible idea to intersperse the groups of songs with chamber music. By way of contrast the Bo Bergman settings are both starkly sombre (Masque) and chant-like (Foolish fire and the elf). Among the chamber works the String Trio stands out for its searchingly Beethovenian manner which it blends with a haunting Mozartian sweetness recalling the contented dialogue of the K364 Sinfonia Concertante. Music for bygone parlours touches on Beethoven's style in the fourth and eighth symphonies with volatile transitions into a grand Waldstein manner. All texts are given in both the sung Swedish and in English translation. How much more useful these Phono-Suecia discs would be if only the sung words and the translation into English were printed side by side. The company resolutely refuses to do this. Instantly accessible contemporary music comfortably adopts the mantle of the nineteenth century greats.